As a child, I loved a book called Lilies, Rabbits and Painted Eggs, by Edna Barth, with illustrations by Ursula Arndt. It told of all the pre-Christian customs and symbols of Easter. Even back then, I was a pagan. When I was too old to be given an Easter basket, I used to make my own. Especially after I moved to the Midwest, the Rites of Spring called for celebration. 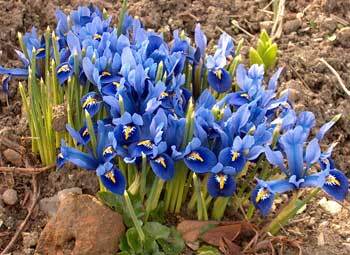 I remember one year in particular when Easter coincided with the arrival of our dwarf iris, which became the finest adornments for my basket. Over time, I became too busy and preoccupied to do the basket. I limited myself to poring over the Bissinger’s catalog of Easter treats. 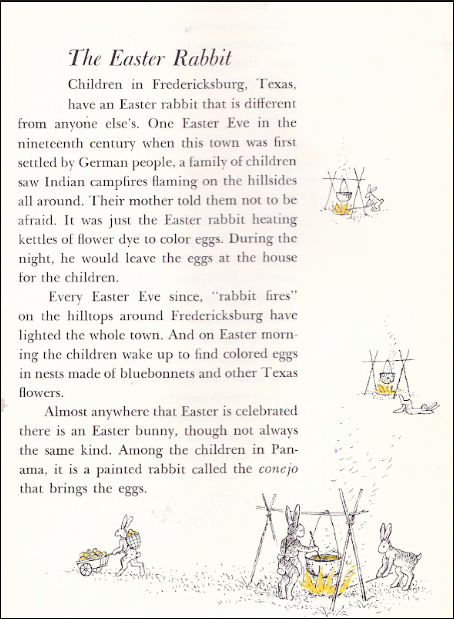 The Easter Rabbit, from “Lilies, Rabbits and Painted Eggs” by Edith Barth. This year something very special happened. I think it was a conspiracy of the Long Suffering Husband with our household gods, Rubber Chicken and Pabbie the Dozy Old Troll. With a little help from the Bunny himself, no doubt. Delectables! Complete with “grass” of colored paper. It’s so beautiful I could weep! Pretty, pretty chocolates. What are the ones wrapped in foil with a pansy on it? 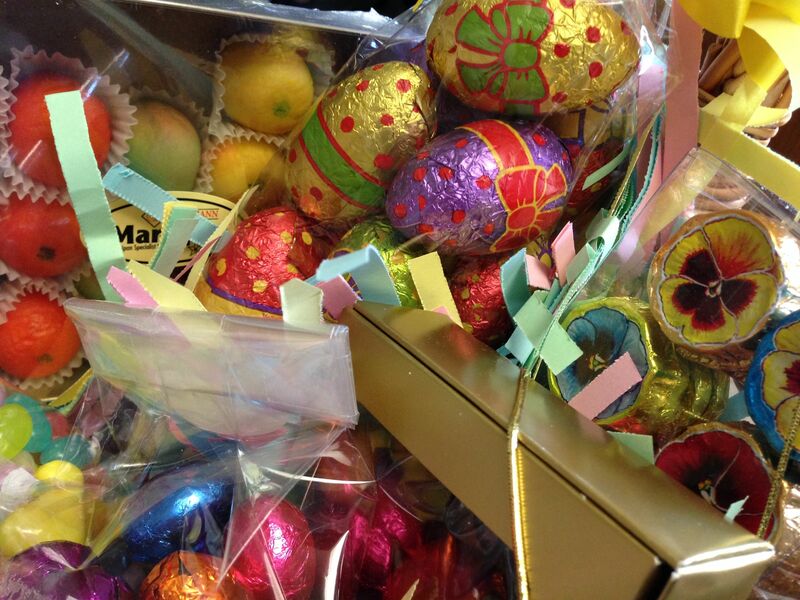 What is the tradition behind Easter Baskets? Is it just something your family did or is it an American thing? Thanks Augie! It is an American thing, I suppose. 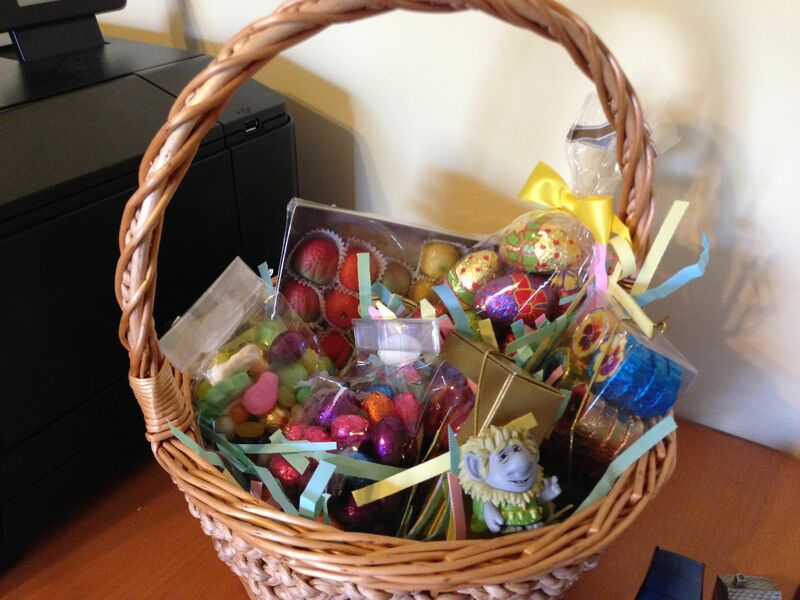 On Easter morning, children receive a basket with treats. I suspect it comes from the tradition of the Easter egg hunt, which involves searching for hidden eggs and collecting them in a basket. As a child, we used to decorate the table with a basket full of colored eggs. Usually the treats in a child’s basket are chocolate eggs and bunnies. The foil pansies are lovely, aren’t they? They are chocolate discs with a pansy decoration. “Receive a basket”??? You lazy sods! We had to hunt for our eggs 🙂 Oh, what great fun it was… better than Christmas. We did egg hunts too, but the basket of chocolate would be sitting at the foot of the bed come morning. It was brought by the Easter Bunny. For some reason he never brought chocolate cake. Same here! I like it precisely because it’s neither religious, nor about spending tons of money (like Christmas). Yes, I was going to write chocolate, but, of course, that is a fairly late addition to the nest/basket. Thank you! I love pansies and violets too. Happy Julian Easter! Do you have children who are NOT sweet toothed??? Lovely! Looks like LSH outdid himself! My tradition growing up was we’d color the eggs then leave them out for the Easter Bunny in our basket along with a few carrots to nourish/tempt the bunny on his busy night. In the AM we’d find the eggs hidden throughout the yard, and the basket filled with treats. This has to be modified for my kids because we live with outdoor chickens and ducks who monitor everything that happens and would demolish the eggs before the hunt could begin! So we just leave the carrots in the basket, which the bunny exchanges for goodies… and somehow or other the bunny knows to hide the eggs at the grandparents’ yard and we go there for a family family gathering later in the day! Happy Easter! Lol about the monitor birds. Would they really destroy the eggs? Why? But I suppose you must have lots of lovely fresh eggs to cook with! They would peck at anything that catches their eye, and finding a lovely boiled egg inside, they would then consume it and go looking for more. This we found out when my young love was 1 1/2 years old and we tried to do his first Easter Egg hunt. Being a toddler, the poultry contingent was much faster than he was, and we spent our time running interference for him! Lol. They eat all kinds of leftovers, mostly vegetable scraps but also any meat I don’t let the dogs have. Makes for tasty eggs! Yes, chickens are quite omnivorous, aren’t they, but I hadn’t realized they liked eggs. It makes sense, especially considering that they are in reality little dinosaurs 🙂 How funny to think that they could outrun a toddler and deprive him of all the goodies! I’ve been trying to think of a way to give our Geordie an Easter egg hunt…that may have to happen at some point today. Thanks! I’m sure he will relish it. Maybe some hard boiled eggs? Well, I was planning on doing a little hunt around the house for treats, but it looks like that isn’t going to happen now. Geordie got bitten by a rattlesnake this morning and almost died in my arms on the way to the vet. It’s been a horrendous morning. He got the anti venom fairly early (we ran stop lights to get him there as quickly as possible), but there’s no saying whether he’ll pull through. Oh my heavens. I am so sorry. I am sending my best thoughts and wishes for you and him. Thanks! I’ve got a post coming up about his recovery. Thankfully, he pulled through and he’s home with us now. What a nice husband you have!!! Happy Eastern to you both! The LSH outdid himself here, how adorable. It is really chock full of delightful Easter treats. Happy Easter to you both. And to you! Spring is finally arriving here–hooray! What is the weather like there? So glad that spring has sprung for you. It’s turning here LM…two crazy days of rain just before Easter and Aussie autumnal cooler mornings and evenings. (Ummmm… That means 22 Celsius during the day and 15 degrees at night….veritably freezing!?) I hope some lovelh Farmers markets start popping back up around you soon! Very special. Kudos to LSH.